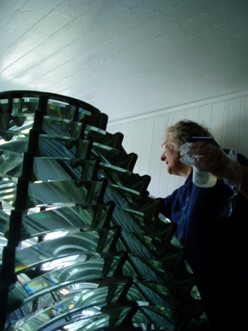 Chapter volunteers returned to Hooper Strait for the second year to do basic cleaning and polishing. 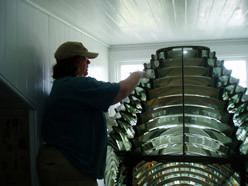 The volunteers drew attention from museum visitors with they questions about the lighthouse and other Bay sentinels. 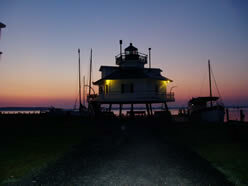 The volunteers were able to spend the night camping out in the lighthouse and treated to a beautiful sunrise. Sound like fun? The Chapter's next workday is scheduled for July 23, 2005 at Ft Washington. Sorry, no camping at this one! To learn more about the Chapter's Volunteer Program, visit the Volunteer page on this site. For A Larger View. Anne, Chapter Vice President for Preservation, works on cleaning 3rd order lens. For A Larger View. Paula works on the opposite side of the 3rd order lens. For A Larger View. Volunteer needed! Someone small enough to fit between the 3rd order lens and the wall. Catherine literally fits the space. For A Larger View. 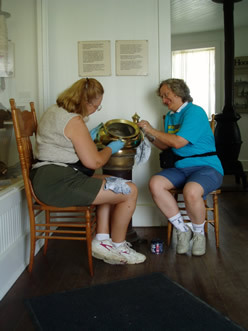 Sandra and Lauren work on polishing the brass binnacle. Paula, Anne, Catherine and Alex all lent a hand with working on this project. For A Larger View. Volunteers enjoy the beautiful sunrise.